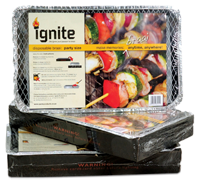 Take a look at our range of premium quality and innovative braai products. You can order online directly form our factory or get a quotation on bulk orders. Watch this space as we continue to add new and exciting products. 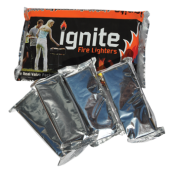 Ignite firelighters come in 4 rows of firelighters individually wrapped in foil. Use 1 row for 1 braai and the rest stay fresh and dry for your next braai. 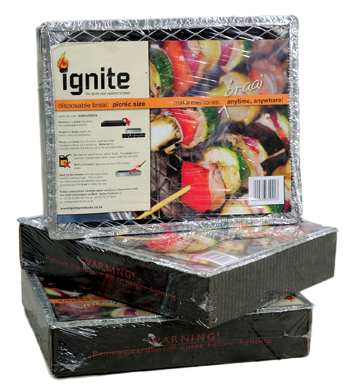 Comes in a box containing 6 x 3kg (2 x 1.5kg) Instant Light Charcoal bags. 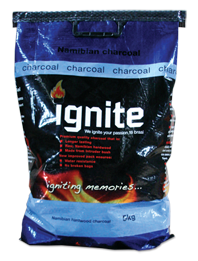 The motto of this 3kg bag is: “Small in size, small in price, BIG on environment.” The charcoal pieces are the same good quality as all Ignite’s charcoal. Bulk orders only. 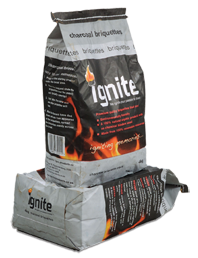 Premium quality, long burning briquettes packed into a 4 kg bag. Perfect for Kettle braai. Bulk orders only. Premium quality, chunky wattle charcoal. These bags are packed with only big pieces of charcoal. Bulk orders only. Made from sawdust and other by-products of timber. Ideal for fireplaces. Burns for a long time, no sparks or spitting and leaves little ash.